Protect the rare, unique and irreplaceable minerals and archaeological resources found in caves. Protect and maintain cave life. Protect the natural groundwater flow in caves from water pollution. Protect the integrity of caves that have unique characteristics or are exemplary natural community types. Make recommendations to interested state agencies concerning any proposed rule, regulation or administrative policy that directly affects the use and conservation of caves in this Commonwealth. Study any matters of special concern relating to caves and karst (irregular limestone region with sinks, underground streams, and caverns). The Virginia Cave Board came up with the idea of a state bat to use as a tool for educating Virginians about caves and the creatures that inhabit them. Board member Clair Ward said that the board thought of the Virginia big-eared bat as an ideal candidate because of its name and its status as a federally endangered species. Virginia Delegate Jackie T. Stump filed House Bill No. 2579 on January 12, 2005. After approval of the House Committee on General Laws, it was read for the first time in the Virginia House of Delegates on January 26, 2005. On February 26, after being approved in both the House of Delegates and the Senate, the bill was signed by the Speaker of the House and the President of the Senate. On March 22, 2005, Governor Marc Warner signed the legislation designating the Virginia Big-eared Bat (Corynorhinus townsendii virginianus) as the official state bat of the Commonwealth of Virginia, effective July 1, 2005. And of the fossil I?m sure you have heard. I'll spare you the Latin. And could 'Zap!' and 'Kapow!' with the best. Only two other states have recognized a bat with an official commendation. In 1995, Texas adopted the Mexican free-tailed bat (Tadarida brasiliensis) as the official flying mammal of the state and, in 2006, Oklahoma did the same. Corynorhinus townsendii virginianus: NatureServe Explorer. 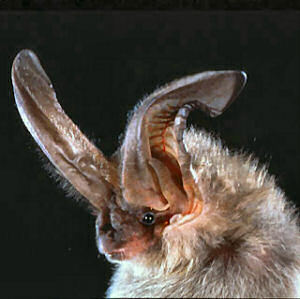 Virginia big-eared bat: Virginia Department of Game & Inland Fisheries. Endangered Species Account: from the US Fish and Wildlife's Division of Endangered Species. Myths and Facts About Bats: from BatWorld.org. Stokes Beginner's Guide to Bats: by Kim Williams, Rob Mies, Donald and Lillian Stokes. 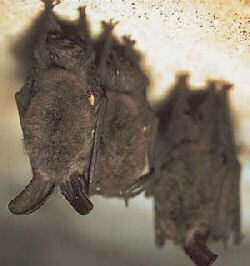 The Bat House Builder's Handbook: by Merlin D. Tuttle, University of Texas Press; Revised edition (June 1, 2001).